Though it was the earliest hours of the morning, my mind was alive as I processed the information of the Bridge Builder Conference with my Collaboratory teammate, Katie. During that drive home Monday morning, we expressed mutual excitement for the upcoming season within the Bridge Group. The sessions and workshops provoked new ideas, and bolstered our confidence that the Bridge Group can be a huge success. This blog aims to share those ideas. Bridges to Prosperity divided the conference into lectures of various types, professional development seminars, and hands-on workshops. I attended one workshop on concrete and masonry, and it was extremely insightful. While development projects lower the standard for quality of work, the task is still just as difficult. The third world mixes most concrete by hand and amidst the elements, causing certain techniques to increase efficiency and strength. Johann Zimmerman taught me the basic ingredients of concrete and the typical ratio for mixing them. 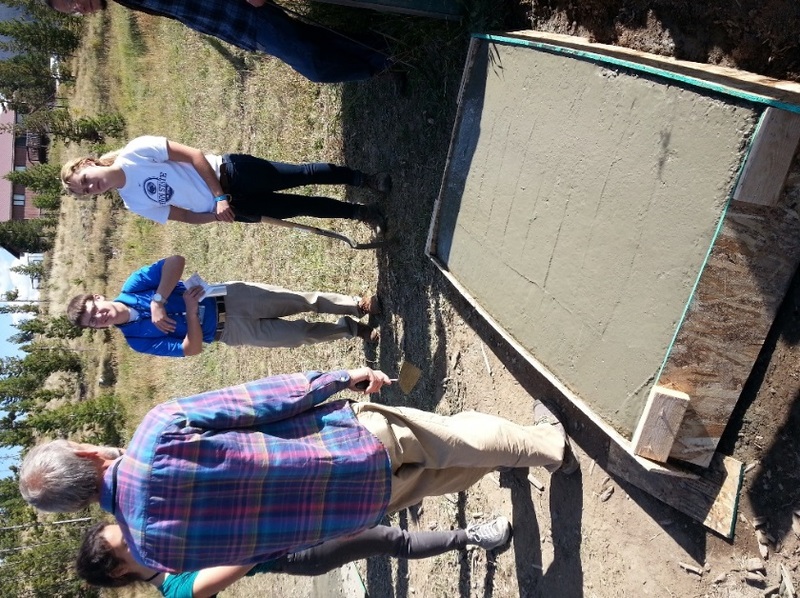 I learned how to mix concrete quickly using two people. His workshop advised creating a clear slab the day before mixing for a clear working space, delegating one person to count mixture parts, and showed us what consistency the product should be for maximum strength. This advice will definitely benefit me some day in the field. 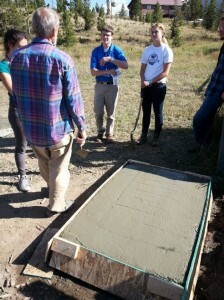 Explaining how to mix concrete efficiently. Johann describing the finished product and demonstrating techniques for forming in the developing world. 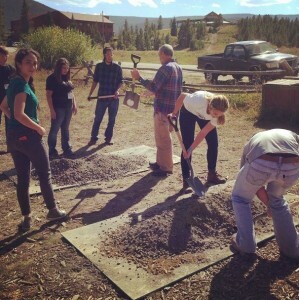 The concrete workshop only accounted for a small fraction of my time at the conference. Most of the transformative information came from the numerous sessions Bridges to Prosperity held throughout the weekend. Development was a reoccurring theme, as well as, sustainability and success. The weekend began with a lecture by professional engineer, Dave Zanetell. He led a team to create the new Hoover Dam bypass and convinced me that the successful corporate skills he used can be translated into the developing world and building bridges within that context. The next morning, Avery Bang, the C.E.O. of Bridges to Prosperity spoke on the importance of footbridges in the developing world and the opportunity for influence through statistics highlighting correlation of health and adequate transportation. I followed this up with a professional development seminar on suspended bridge design. Most of the information was geared toward those in industry or those who have constructed bridges in the past; however, I was still able to glean some good tips on which clamp brands to use, the importance of trustworthy materials, and so forth. After lunch, everyone gathered for another keynote lecture about how to measure program impacts. Kevin Donovan and Wyatt Brooks shared great information on how to choose location for bridges and set up systems that monitored the use and overall success of the bridges. Before dinner, a panel of professionals working for NGOs held a discussion on careers in international development. They gave testimony to the various paths into the development sector and the benefits and hindrances of each. The next day, I went to a safety briefing. The developing world has no policies and liability, which, when combined with more primitive working supplies, can arguably make conditions much more dangerous. Emily Braucher ended the conference with a phenomenal lecture on cross-cultural communication and power. She challenged the current way we do and think about development, as well as, expressed the importance of understanding various communication styles. Excitement and curiosity filled my mind in the weeks leading up to the conference. I left feeling fulfilled and transformed. As a representative from my Collaboratory group, I felt that I had learned valuable information to guide our next steps. 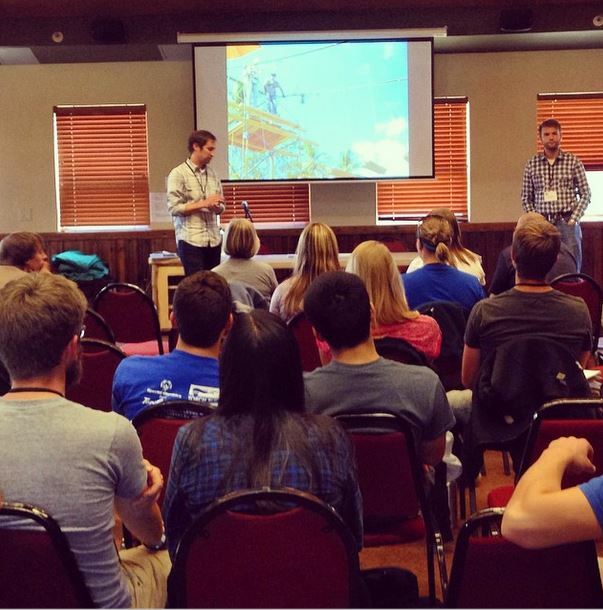 The Collaboratory approaches its project with a business model. This benefits students because they experience various aspects of the professional world such as clients, deadlines, and documentation. At first, it looks like a perfect setup, but it could come at the expense of the communities for whom we are working. Effective humanitarian work comes from teaching and empowering communities to a level where they will become self-sufficient and continue the work on their own. When we come in with our own agenda, and, even if we do not realize it, fail to interact with and involve the community, the project becomes something for our own satisfaction and is not sustainable. I do not believe this is necessarily bad, but we need to carefully analyze our purpose within the Collaboratory and if we are focusing more on personal gains or those we are serving. On a personal level, I received a greater affirmation to my calling in development work. The Bridge Builder Conference exposed me to all sides of development work and the various paths to get there. Many development focused, engineering NGOs exist, but only a couple approach their work from a faith background. Even faith-based, non-profits with engineering type work, such as World Vision, have no ministry component. This worries me, but at the same time has opened my eyes to opportunities of founding something like this. Lectures on cross-cultural communication and transportation dispensed wisdom about international interaction as an individual and the prosperity that comes from adequate transportation. There was no shortage of knowledge spat out at the conference. I hope that many groups and individuals can grow from it and become more effective in their work. I would like to thank Messiah College’s Student Government Association for providing grant money that made this attendance possible. Time to build some bridges!